Project 3: What's Your Purpose? 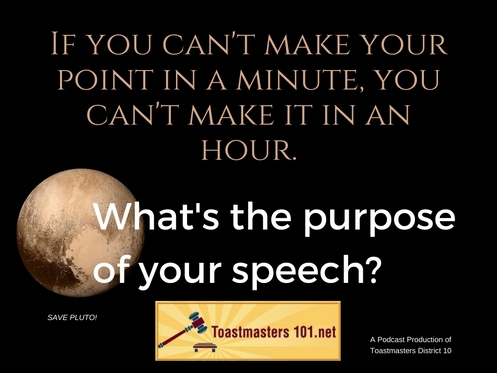 By knowing your speech purpose, you’ll be able to limit your topic and exclude material that’s not specific to your speech. Often, this will help you decide what to include and what to exclude from your presentation. No matter how funny the joke you heard last night was, you have to decide if it fits into your speech. As your audience is giving you the time (and time equals money) and attention, they expect value in return. Your task is to honor them. This is the kind of thing that makes you get more nervous – repeating an error just drills the bad into your head instead of the good. Practice the tough lines several times before you go onstage. If you get it wrong, don’t make a big issue out of it, or make fun of yourself, or apologize. Just keep moving along. This minimizes your chances of getting more negative reinforcement. Stage fright is what we call the negative symptoms our bodies respond with to stress. These responses can be channeled into positive ways. You can take that energy and put it into your voice or body movements to create more interest in your speech. You can’t really ignore it, but you can learn to manage it. The more opportunities you take to get on stage, the more you’ll gain control of your emotional physical reactions. When you join Toastmasters, you’ll be given two different manuals. The first – the Competent Communicator Manual – covers the 10 speech projects you’ll do in the meetings. The other book – the Competent Leadership Manual – will introduce you to the various roles in the Toastmasters meetings, including speaker, timer, grammarian and ah-counter (in many clubs, these roles are combined), evaluator, meeting toastmaster and general evaluator. My Speech Purpose? Your Call to Action: Please review us on iTunes – use the button to go right to our podcast listing.